Brazil is experiencing a deep economic, political, social and environmental crisis as a result of the international crisis of capitalism and the inability of this system to solve the contradictions it generates. In this context, authoritarian solutions, such as coup d’états and attacks on democracy, have been the formula adopted to guarantee the implementation of a violent neoliberal offensive that removes the rights of the workers while at the same time hijacks and subordinates the State to the interests of large business groups. In order to confront them, it is necessary to have clarity and to identify who is responsible for this crisis and the political instability in which we live: international financial capital; the media, especially Rede Globo , which fed and inflated the coup-mongers and fascist movements; and the Judiciary, which, on the one hand, places its own interests and privileges above the Constitution, and, on the other hand, rewards with impunity all repression and violence against the poor. This moment demands the unity of the progressive forces in the action and effort to build a Popular Project for Brazil that is able to face the structural problems of our country, struggling against misery and unemployment; resuming development; facing housing and urban mobility issues in the cities; guaranteeing free access to quality healthcare and education; carrying out agrarian reform in the countryside; protecting natural resources as a common good and preventing their privatization; and regaining national sovereignty. That is why we call on the Brazilian society as a whole to build and participate in the Congress of the Brazilian People, organized by the Brazil Popular Front, to be the space for discussion and organization on the country’s problems and the structural measures necessary to overcome them. We also reaffirm our conviction of the innocence of President Lula, defend his right to run for presidential elections and, in the face of this political imprisonment resulting from an illegal and illegitimate process, demand his freedom! 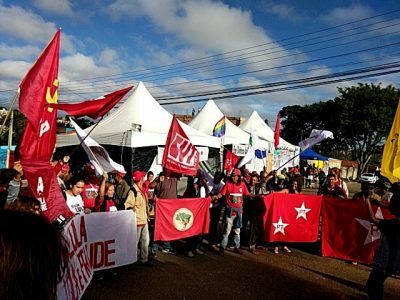 For all these reasons, the Landless Rural Workers’ Movement is publicly declaring its support for Luiz Inacio Lula da Silva’s candidacy, since we understand that it represents the struggle against the coup and the aspirations of the Brazilian people for change in this scenario of crisis that plagues us all. We will not forget or condone impunity and therefore we demand the solution and justice for the murder of our comrade Marielle, as well as for so many young poor victims of the repression. May your example in life continue to inspire young people, women and workers in these times of repression and authoritarianism. In her memory, not one moment of silence, but the commitment and struggle of the workers and landless rural workers against the coup, against the withdrawal of rights and freedom, for a more just, equitable and sovereign country! To Fight, To Build Popular Agrarian Reform!